This is the largest of the City's Area Parks and serves the North of the city. It is a well established green space with expanses of grass, colourful bedding schemes, picturesque tree lined river walk, ecological and wildlife areas and a range of facilities for all the family to enjoy, including a play area, skate park, and a multi use games area. The extensive and well used footpath system is ideal as an exercise facility using the distance marked routes and as a dog walking venue. The active Friends Group and Longford CAN assist with planning new developments, volunteer opportunities and events in the park. 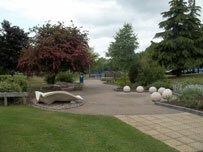 The play area was improved and extended in 2011, again following local consultation and the involvement of local groups. The park has been awarded with the Green Flag award, which provides a national benchmark for the best green spaces in the country. Magic Mile event happens third Sunday of every month. It starts at the Windmill Road entrance. Meet at 10am for a 10.15am start. Magic Mile is an inclusive, measured mile route that you can run, walk, skip , jump or do whatever you like to get active. The Friends of Longford Park meet every first Wednesday of the month at the Longford Road end to plan their projects (no meeting in January).